To help ensure that your document enters publication without any regrets, Word 2016 offers a tool called the Document Inspector. It’s designed to remove certain items from your document, such as comments, hidden text, revision marks, and other items that might be necessary for document production but unwanted for publication. Always save before performing a document inspection. Some of the changed items cannot be reversed, in which case the saved copy serves as a backup. The Info screen appears. If not, click Info on the left side of the window. Click the Check for Issues button and choose Inspect Document. If you haven’t recently saved your document, you’re prompted to do so; click Yes. The Document Inspector dialog box appears, shown on the left. It lists items you might have overlooked or forgotten about. You can add or remove check marks to direct the inspector to find or ignore specific items. Word scours the document, checking for those items you selected in the Document Inspector dialog box. A summary appears, listing items of concern, as shown in the right. Click the Remove All button to purge your document of the unwanted items. Look to ensure that none of the changes did something unintended. The Document Inspector dialog box. In case something untoward happened and you can’t undo the action, do not save the document! Close it, and then open the copy you saved in Step 1. That’s your best avenue for recovery. 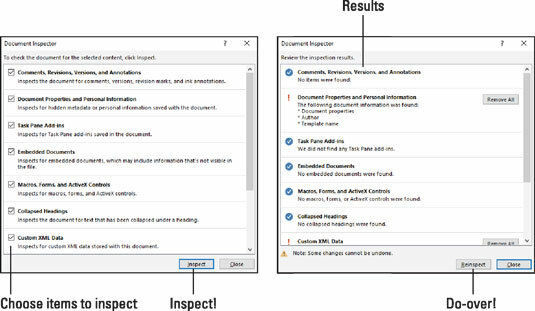 The purpose of the Document Inspector is to ensure that unwanted items don’t remain in your document before you release it into the wild. This holds true especially for electronic documents.